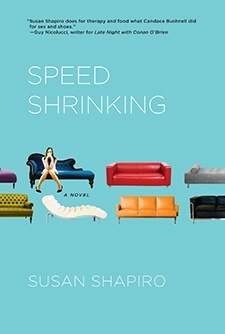 In Susan Shapiro’s laugh-out-loud funny fictional debut Speed Shrinking, Manhattan self-help author Julia Goodman thinks she’s got her addictive personality under control. Then her beloved psychoanalyst moves away at the same time her husband takes off to L.A. and her best friend gets married and moves to Ohio. Feeling lonely and left out, Julia fills in the void with food, becomes a cupcake addict, and blimps out. This is a huge problem—especially since she’s about to go on national television to plug her hot new self-help book about how she conquered her sugar addiction.